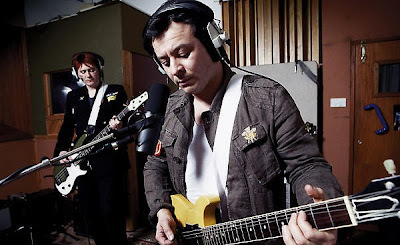 In anticipation of their new album, Rewind The Film, which drops on September 16, the Manic Street Preachers today unveiled the wondrous and nearly-rapturous "Show Me The Wonder" on the BBC and their website. Just when I think that this band can't surprise or inspire me again, they somehow manage to re-invent themselves one more time. In the span of just a few years they've gone from "Indian Summer" to the Richey Edwards semi-written "She Bathed Herself In A Bath Of Bleach" to this Talking Heads-quoting folk-y -- !!! -- strum-along-jam! Are my beloved Manics turning into a taffy Rusted Root!?! Dear Lord, I hope not! There's no shame in penning a song this seemingly happy. They've earned it over the course of their two decades in the industry.